Bugsworth Basin in Derbyshire, on the terminus of the Peak Forest Canal. offers wonderful insights into our industrial history and still possesses some amazing industrial archaeology. 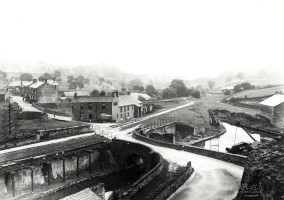 The Peak Forest Canal was constructed under the provisions of an act of parliament in 1794 and was completed in 1804. The chief engineer was Benjamin Outram. The navigation provided a route from the Ashton Canal to the limestone quarrying areas beyond Bugsworth (now Buxworth). The main line of the canal terminated at Bugsworth, although it had been intended to carry it further on into what is now the Peak District at Chapel Milton. On this final stretch, however, heavy and complex locks would have been necessary and the expense of this convinced the canal company that a tramway link between the canal terminus at Bugsworth and the quarry areas would be a better option. The Bugsworth basins were a busy and complex wharf area for not only did they provide loading and storage facilities, common to most canal sites, they also contained processing equipment for limestone, the main traffic carried from the basins. In its heyday during the 1880s, the canal basins here were shipping out up to 600 tons of limestone per day, but by 1921 traffic had ceased and in 1923 the Bugsworth arm and basins effectively closed, though during the Second World War the arm was opened for a very short period for the carriage of limestone after minor repairs had been done to the bed. Since the 1940's the site gradually became silted up and overgrown and in the late 1960s the Inland Waterways Protection Society (IWPS) were given permission by the British Waterways Board to commence the restoration of the canal arm. For more than 40 years the IWPS strove to restore this historically important complex. It is now a scheduled Ancient Monument and attracts more than 50,000 visitors a year. What was IWPS now manage promotion of, and access to, the site and have, therefore, renamed themselves the Bugsworth Basin Heritage Trust.